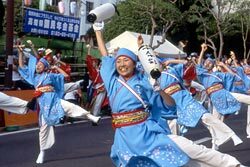 Competing with Tokushima's Awa odori is the Yosakoi Festival, which began in Kochi Prefecture, also located on the island of Shikoku. The festival began in 1954 after the creation of the official Yosakoi Naruko Dance, which is based on a folk song called "Yosakoi Bushi (Melody)." This is accompanied by dancing to the up-tempo beat of the chant "Yochoreyo, yochoreyo" while carrying a pair of naruko, a kind of clappers that make a click-clack sound. In the past, people in Kochi used these naruko to scare sparrows away from their farm fields. The dance is no longer performed in just one style. The yosakoi dance has taken in all sorts of new ideas, and it's quite typical for dancers to don bright and showy hairdos and costumes. Some other creative additions to the dance include live rock band performances, samba or rock melodies and choreography, or themes based on popular movies. There are three main rules for participants: Each team must have no more than 150 people; while moving forward you must dance with naruko in hand; and any musical arrangement is acceptable, but it must include the "Yosakoi Bushi." Since these rules allow for a lot of creativity, the dance has become very popular among young people. The number of participants has been increasing yearly, and now over 10,000 dancers participate. A wildly decorated truck called jikatasha leads each team. Then come the dancers, who wear all sorts of brightly colored costumes and dance excitedly while carrying naruko of every color. With so many performance groups passing through the downtown area of Kochi City, it's like a giant carnival. If you get a chance to see it up close, you'll experience some serious dancing. If you go to the festival there is a special dance group that you can join after about one hour of practice. It only costs 2,000 yen per person, which includes your own naruko and happi coat. 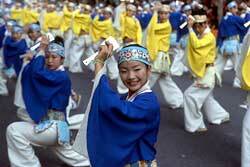 The main performance for the Yosakoi Festival takes place every year on August 10 and 11. From Tokyo, Kochi is about one hour by plane. If you go to JR Kochi Station there are buses and trains you can take to various festival sites. To participate in the beginner's niwaka-ren, go to the plaza in front of the Kochi City Municipal Building or other designated area. Be sure to check beforehand for the appropriate time and location.